Jubilee (also known as Jubileum) is best thought of as an improved large-fruited Victoria plum, although it is not closely related. Like Victoria, it excels as a culinary plum, but it is arguably superior for eating fresh. The fruit is larger and a slightly darker red than Victoria. The flavour is a good balance of sweetness and sharpness, and the stone separates easily from the flesh. Please fill in the details below and we will let you know when Jubilee plum trees are back in stock. Plum pox virus: Some resistance? Jubilee is in flowering group 3. Jubilee is self-fertile and does not need a pollination partner, although fruiting may be improved if there is a compatible tree of a different variety nearby. Since it flowers in the middle of the blossom season it can be pollinated by most other plum trees. Jubilee is similar to Victoria in that it crops very heavily, and is self-fertile, but it is more disease-resistant. It ripens just ahead of Victoria, usually around late August in southern England. The trees are notably cold-hardy (having been developed for Swedish conditions) and start to produce plums from a young age - typically in the 3rd year. The main problem when growing Jubilee is its tendency to set a very heavy crop. This causes fruit size to be reduced, along with flavour. It can also put too much weight on the tree, causing branches to snap. The simple (but tedious) solution is to thin the fruitlets in mid-spring - you should still get plenty of plums, but fruit size and flavour will be greatly improved. Jubilee was developed at the SLU Balsgard research station in southern Sweden, and is more correctly known as Jubileum. It is a cross between Giant and Yakima. Despite the Japanese-sounding name, Yakima is a true European plum, with a sweet flavour. 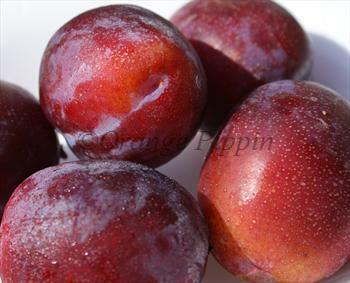 Both Giant and Yakima have very large fruits, and this explains the relatively large size of Jubilee plums. The name Jubilee was also used for another plum variety raised by Laxton Brothers nursery in 1905.